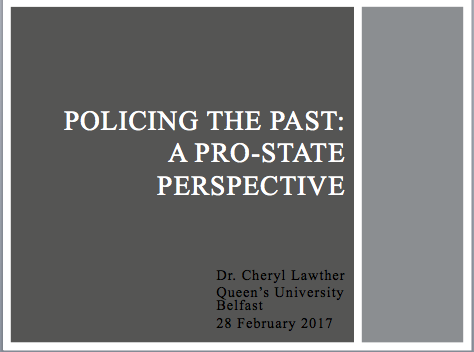 On 28 February 2017, Dr. Cheryl Lawther presented an invited paper on ‘Policing the Past: A Pro-State Perspective’ at the School of Law, University of Warwick. Drawing on her empirical work, this paper considered attitudes to dealing with the past amongst members of the security forces. A full copy of this presentation is available on request.